Two weeks ago some friends and I participated in the MS Walk & Fun Run, to help raise money for MS research. This year they've already exceeded their goal for fundraising - over $500,000 - yay! You could either choose between 5 or 10 kilometres, and walking or running. I think y'all can guess which option I chose, haha. So, after our leisurely 5 K stroll around Albert Park Lake, my bro decided he'd make it 10 K's, and did another lap, while the rest of us went to peruse the stalls. Trolley Dog stand - look out for one next time you are at a festival. Yum! The sausage itself was delicious, and better than the Wagner's sausage stands that you commonly see at festivals here. I also got a cappuccino from the back of a van (a Van Go Franchise van, if you're interested). It was, well, drinkable, but I was more interested in the novelty of the whole thing. Walking sure can build up an appetite, so even after Trolley Dogs, we decided to try out Old Town Kopitiam in Chinatown. We've been meaning to try it forever, but never got around to it before. While we're on the topic of building up an appetite, let me share with you some little titbits about being Malaysian. Number 1: We eat a lot. (Duh). And Number 2: We don't like things to get in the way of us eating a lot. Take, for example, my 40-year old cousin who lives in KL. At his age, and with all the rich food available in Malaysia, you'd expect him to start eating less. Nah-uh! He's on the treadmill for an hour a day (!!!) so he can fit in all the food he wants and not gain weight. (And he eats a lot). One more example. 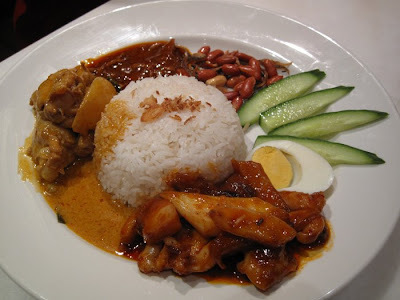 A few years ago, when I went back to Malaysia for a holiday, I was having a chat with an "aunty" at dinner about how much of a struggle it was to eat such gargantuan quantities of food in the heat. Her response was, "Oh yes, my daughter felt that way too when she came back from overseas. It's probably because you're on holiday and aren't moving enough. You should try doing a bit of exercise during the day so you can eat more at night!" I love it how the thought of eating less never crosses our minds, hehehe. Old Town Kopitiam is set up like a very clean canteen, and is super-duper Malaysian - from the waiters, to the menu, to the round stools we sat on (much like this one!). Hot milk tea - excruciatingly sweet, but they were really nice about adding some more plain milk to it. Left: Kickapoo (hehe) soft drink. Right: I think it's coffee with grass jelly inside. My bro's gf Su ordered this noodle dish, and was really excited when she saw it on the menu. I'll have to double check with her exactly what it was; I just remember it had a Chinese name. I hadn't heard of it before, but I reckon that's because she's a Canto-speaking KL girl, whereas we are Hokkien Penang-ites! It tasted, again, like the style a Malaysian mum would make. This was my one - the chicken curry was the same one that came with the roti canai, delicious. I wasn't so keen on the squid curry - it was a bit tough - so I left most of that curry uneaten. The rest, however, was great! I think it's like $2 less if you don't get a seafood curry, so next time I'll do that. 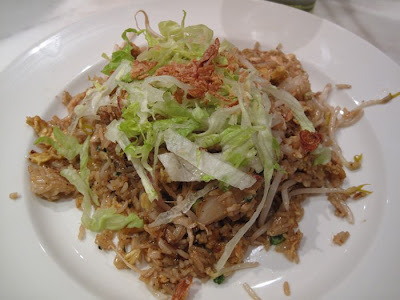 Some hits, some misses, but overall I liked Old Town Kopitiam. The prices weren't bad, about $8-$12 for the mains, and the service was friendly and reasonably fast. 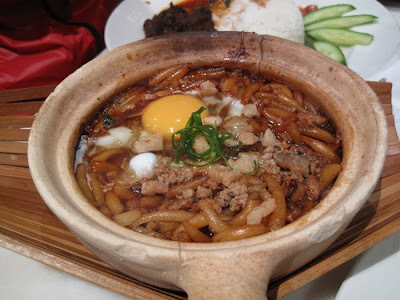 That claypot noodle dish looks a lot like loh shee fun to me! You Penangites would know it better as mee tai mak - they do it stir-fried at Gurney Drive. I gym 4 times a week so I can eat as much as I want, and still fit into my jeans! Brilliant. For the past few visits to Old Town Kopitiam, it's disappointing to know that chendol is still not being served on the menu.